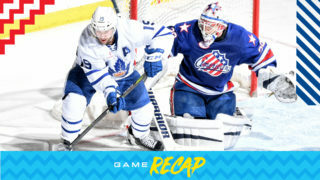 The Marlies paid a visit to Hershey, Pennsylvania Friday night to kick off a three in three weekend. 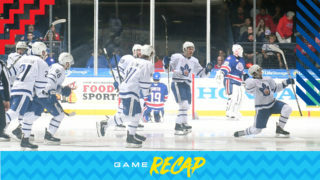 After dropping their last two contests, the Marlies were looking to get back in the win column. After a scoreless first, the Marlies opened the scoring in the second period with a power play goal at 7:28 from Adam Brooks. Chris Mueller, who was a welcome addition returning to the lineup for the first time since February 10th, picked up the primary assist on the goal and Dmytro Timashov had the extra assist on Brooks’ 17thof the season. That goal opened the flood gates and just over a minute later, the Bears responded as Jayson Megna evened the score 1-1. At 10:33, the Marlies converted on another man-advantage as Jeremy Bracco let a shot fly from the top of the faceoff circle to restore the Marlies’ one-goal lead. Rasmus Sandin and Timashov assisted on Bracco’s 18thof the season. Again, the Bears responded quickly as Nathan Walker evened the score 2-2 at 12:13. The Marlies added back-to-back goals a minute a part to close out a wild second period. 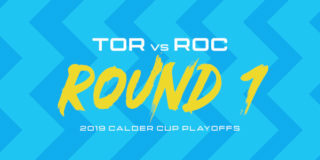 Michael Carcone scored the go-ahead goal at 14:03 to make it 3-2, assisted by Tanner MacMaster and Scott Pooley, and Jordan Subban buried a laser pass from Jeremy Bracco at 15:02 to give the Marlies a two-goal cushion heading into the final frame. The Bears added two third period goals from Garrett Pilon and Devante Smith-Pelly to send things into overtime. 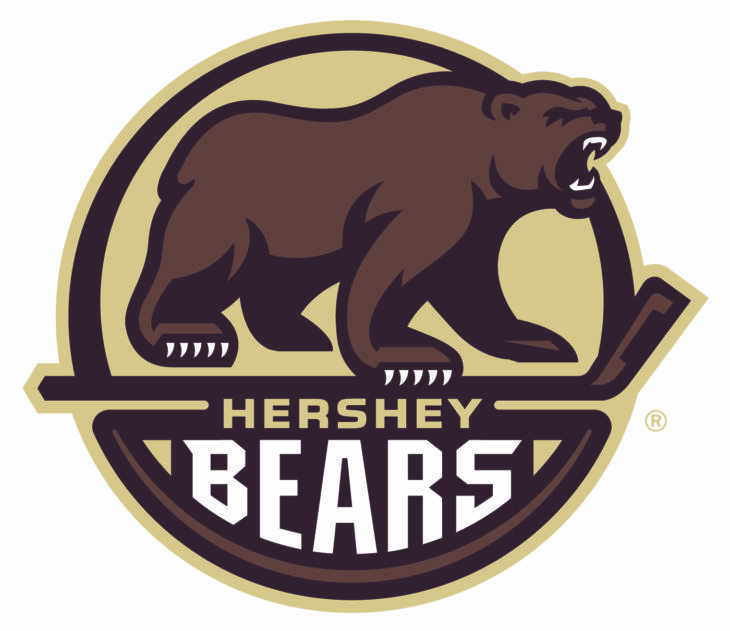 1:08 into extra time, Hershey’s Mike Sgarbossa would sit for two on a tripping call, resulting in some 4-on-3 action. Jeremy Bracco found Chris Mueller on the doorstep and he buried the overtime winner. The Marlies continue their three-game road swing, taking on the Lehigh Valley Phantoms tomorrow for a 7:05 PM start. Adam Brooks opened the scoring on the power pay at 7:28 of the second period. Brooks has collected seven points (4 goals, 3 assists) in his last eight games. Jeremy Bracco scored on the power play at 10:33 of the second period and later added the primary assists on Subban’s second period goal and Mueller’s overtime power play goal. Bracco has 16 points (4 goals, 12 assists) in his last 12 games. This is his 19th multipoint game of the season and the seventh time he’s recorded three or more points in one game. Michael Carcone scored at 14:03 of the second period. Carcone has 38 points (17 goals, 21 assists) through 51 games this season. Jordan Subban scored at 15:02 of the second period. Subban has 12 points (3 goals, 9 assists) in 38 games this season. Chris Mueller scored the game-winning goal on the power play at 1:39 of overtime. He earlier recorded the primary assist on Brooks’ second period power play goal. This is Mueller’s seventh game-winning goal and his fourth overtime goal this season. Mueller has 53 points (25 goals, 28 assists) in 48 games this season. This is Mueller’s first game since returning from injury on Feb. 10. Dmytro Timashov registered the secondary assists on Brooks’ and Bracco’s power play goals, both in the second period. Timashov has 12 points (6 goals, 6 assists) in his last 12 games. This is his ninth multipoint game of the season. Rasmus Sandin picked up the primary assist on Bracco’s second period power play goal and the secondary assist on Mueller’s overtime goal. This is Sandin’s fifth consecutive game recording a point (1-6-7). Tanner MacMaster had the primary assist on Carcone’s second period goal. MacMaster has 15 points (3 goals, 12 assists) through 45 games this season. Scott Pooley recorded the secondary assist on Carcone’s second period goal. This is Pooley’s first point this season in two games with Toronto. Vincent LoVerde registered the secondary assist on Subban’s second period goal. LoVerde has recorded a point (1-2-3) in three consecutive games. Michael Hutchinson stopped 16 of 20 shots he faced. Hutchinson’s recorded with the Marlies is now 11-3-3-0 on the season with a .907 Save Percentage and a 2.86 Goals Against Average. Toronto is 18-7-3-2 since January 4 and have outscored their opponents 98-84, facing 15 different teams. In 23 of 30 games, Toronto has earned a point (41). Toronto went 4-for-4 on the penalty kill and 3-for-9 on the power play. Toronto’s power play on the road is second (26.0%) in the AHL with the most power play goals-for (38). This is the fourth time this season Toronto has scored three power play goals. Toronto has not allowed a power play goal in six games through 20 penalties. Toronto had a 27-20 edge in shots in all situations. 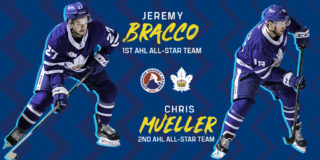 Jeremy Bracco and Chris Mueller led the Marlies with four shots on goal. 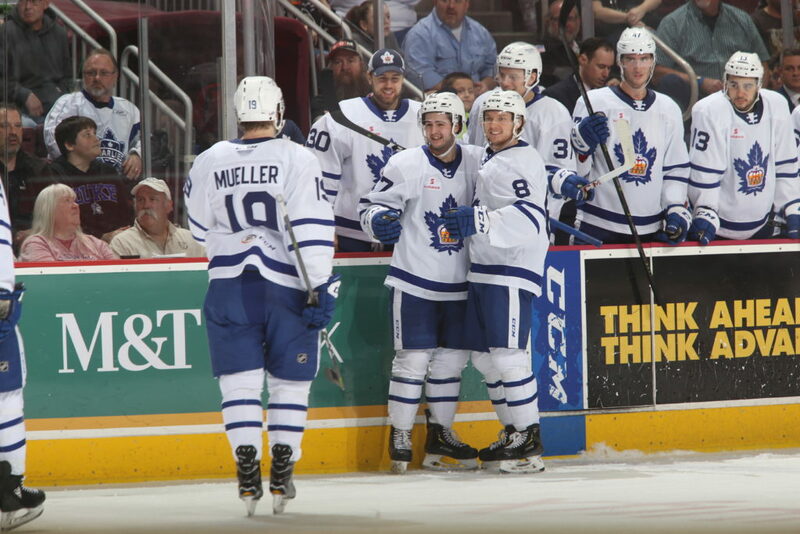 The Marlies are 8-5-0-1 against Atlantic Division opponents and are 1-0-0-0 against the Bears. Toronto is 27-7-1-2 when recording the first goal of the game. The Marlies are 9-5-3-1 when tied after the first period and 24-1-1-1 when leading after the second period. Toronto is 16-10-4-2 when outshooting their opponent. The Marlies are 9-5-2-2 in Friday games and are 4-1-0-1 in March. Jeremy Bracco has points (2-4-6) in three consecutive games. Adam Brooks has points (1-1-2) in consecutive games. Vincent LoVerde has points (1-2-3) in three consecutive games. Rasmus Sandin has points (1-6-7) in five consecutive games. Colin Greening (knee) did not dress for tonight’s game. He left Toronto’s game in the third period on March 10 against Bridgport and did not return. March 7: Returned forward Brady Ferguson on loan to Newfoundland (ECHL). It was a funny game. So much special teams going on, so many penalties, not a lot of great flow to it. It took a while for our power play to get going and once it did, it put us in a good spot. Third period is a strange one. I thought we actually started extremely well. Right up until we took the penalty, we were playing as perfect as we could have asked for at that point. A goal for them and then we have a couple not great shifts after that and then give up the second (goal). I think it was three shots on goal that we gave up in the third period, I thought we did a good job there, we just didn’t get rewarded for it but good on our power play for coming through for us again. Just his presence. It took him a little while to get back up and running the way that he was before, playing so well for us. Just his presence on the ice, on the bench, in the locker room, in the faceoff circle, those types of things all really help get us going. But today Jeremy Bracco was a real positive force for us as he has been with so many people out, he’s continued to roll on and drive our offence. We got enough to win the game. We’d like to do a better job at five-on-five but if special team can continue to do their job the way that it has, we’re going to win a lot of games. 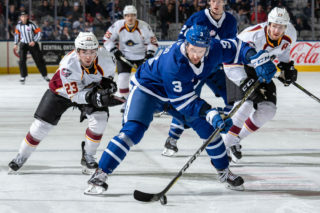 The Toronto Marlies kick off a three in three weekend tonight with a stop in Hershey, Pennsylvania to take on the Bears for their first of two meetings this season. The Marlies will be looking to snap a two-game losing streak tonight while the Bears will look to extend their win streak to three straight. Coming into tonight’s game the Bears are riding a four-game point streak while the Marlies have picked up seven points in their past five games. 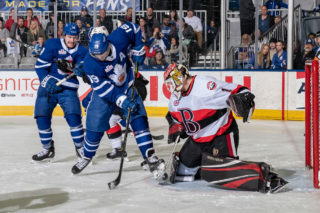 Both teams sit third in their respective divisions with 74 points apiece and the Marlies sit in fifth just ahead of the sixth place Bears in the Eastern Conference standings. With an important two points on the line tonight, it is sure to be an exciting game between these two evenly matched teams. The Bears have been hot at home this season with a 20-10-0-1 when playing at the Giant Center, and the Marlies have had a strong showing on the road with a 17-8-2-3 record when away from the Coliseum. Players to watch: Jeremy Bracco has continued to be consistent contributor in the Marlies lineup this season. He has registered 13 points (three goals, seven assists) in his last 11 games and continues to lead the league in assists with 45. Rasmus Sandin is finding his stride since returning from injury and has recorded a point (one goal, four assists) in four consecutive games.